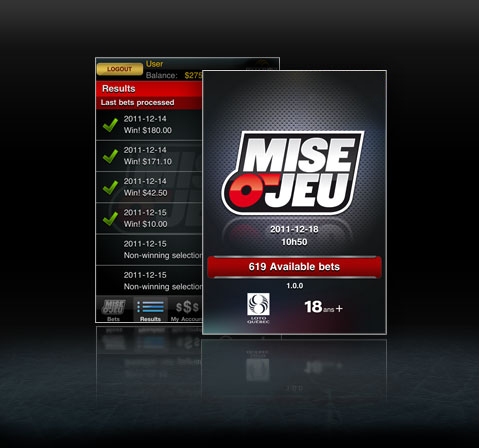 This application,* enables you to prepare your Mise-o-jeu selection using a bar code and to register it with a Loto-Québec retailer or you can purchase a Mise-o-jeu+ selection directly online on Loto-Québec's online gaming site. Click on the image to download the Mise-o-jeu application or simply scan the QR code below. You will need to go to miseojeu.com/android/en using your mobile phone or simply scan the QR code below. *This application requires an Internet connection. It is reserved exclusively for users aged 18 or over and can only be used within the Province of Québec. Its use can only be possible by enabling location services. TMTM Android is a trademark of Google Inc.
iPhone is a trademark of Apple Inc .